Why My Web Traffic Dropped? Has your site been Offline? Verify if your site is (and has been) online and correctly working, or if it might have been down due to technical issues. You can be alerted when this happens by using an “uptime service” such as: Pingdom Uptime Monitoring, UptimeRobot or Little Warden. Do you have analytics tracking issues? Google Analytics Web tracking setup is correct for which you can verify if you have lost the traffic from all the sources or it is only happening to organic, as well as if this is something affecting all of your site’s pages or only certain areas.If it’s happening to all the traffic and not only to organic, use Google Tag assistant to verify your top pages Google Analytics tracking configuration, as it could be due to a configuration error in existing pages or new ones, such as those generated when launching AMP -for which you will need to set up Google AMP Client ID API service– that could not be correctly tracked. Make sure that your site is running smoothly and all your properties pages are correctly tracked before moving on. 2. A search behavior change? Compare your current traffic trend with the ones of previous years: Use your Web Analytics, to see if they coincide. If there’s a difference verify if this only happens with your organic traffic or also with any other source of traffic too. Identify your audience search volume trend for your targeted queries: Using the Google Keyword Planner “Search volume trends” feature or the trend shown in most of keyword tools, such as KWFinder, in case you don’t have historical data to see if they coincide with your traffic trend. The goal should be to identify if the negative traffic trend is due to a lower number of searches and/or overall traffic activity due to seasonality or any other change in the audience behavior. 3. A search results page change? See if there has been a change in the way your pages -or the ones of your competitors- are displayed in search results for the queries you have been ranking, impacting their visibility and CTR. Use your own Google Search Console CTR vs. Impressions data from the Performance report: Look for drops in Google Search Console “Search Analytics” (“Performance“) CTR vs. Impressions trend over time for your top queries and pages per search type (Web, image, video), as well as the rich results metrics and AMP metrics under the “search appearance” and enhancements reports. Check keywords tools SERP Features for your domain vs. the competition: Checking your site SERP visibility metrics in SEMrush SERP features or Sistrix SERP features, and compare them with the ones of your competition, in case they have been the ones increasing their visibility, impacting your site pages CTR negatively. Before worrying over a potential rankings loss, verify first if the negative traffic trend is due to a lower CTR caused by a change in the way your pages are displayed in search results and/or their visibility vs. others sites or ads. 4. A real drop in organic search rankings? Verifying your rankings per query, pages, in each device and search type with Google Search Console “Search Analytics” (“Performance”) section, SEMrush, SearchMetrics or Sistrix Visibility in case you don’t specifically monitor your rankings with tools like SEOmonitor or STAT (which is also recommended to do) to identify which are the specific areas, pages types and queries affected by the loss in case it hasn’t been something affecting the whole site. Comparing your rankings vs. the ones of your competitors to identify if they have also lost them too, and see which of them have increased in rankings while you have decreased. If you can identify a real drop in rankings, whether in certain pages or the overall site that also correlates in the dates of your traffic loss, then you should identify its causes in order to fix the issues. 4.1. A content crawlability issue? Have you changed your site Web structure, migrated towards HTTPS or another domain without following SEO best practices accordingly, or moved to a new CDN or hosting without checking that their configuration allowed search bots access, and now Google can’t reach your pages? You can be alerted of technical configurations that can cause crawlability issues with Little Warden or ContentKing. Revise your Crawl Errors and Stats from the old version and to the new Google Search Console “Index Coverage” report, to find potential crawling errors affecting those pages for which you have identified a rankings and traffic drop. If you find them there, check which type of error it is: Server errors (5xx), unauthorized requests (401), not found (404), blocked by robots.txt, redirect errors, soft 404s, among others. Validate that the crawlability issues are still happening with Google Search Console’s “Fetch as Google” and selecting the “Fetch and Render” functionality, with both the desktop and smartphone bots to verify that they are correctly accessible, and alternatively verify the configuration of your Robots.txt, for which you can use Google Search Console Robots Testing Tool, if a Robots.txt blockage was specified as the cause of the crawlability issue. Verify yourself that you’re blocking the Googlebot, by crawling the site simulating the mobile as well as desktop ones with SEO crawlers like ScreamingFrog, Deepcrawl, Botify, Sitebulb, Ryte and OnCrawl. If the results are not yet clear: Check your Web server logs to look for crawling issues and identify if there’s a correlation with the drop times, areas and devices and/or gaps with your own crawling and traffic, by using tools like Screaming Frog Log Analyzer, SEOlyzer, Botify Log Analyzer, OnCrawl or Loggly. If you have changed your URL structure and verified that are suffering from crawlability issues, check out these Web migration’s SEO best practices and steps to follow if you haven’t done a Web migration well to recover your traffic. After fixing and verified that the issues are gone, remember to use the “Validate Fix” option from the new Google Search Console “Index Coverage” report for the affected pages, which will recrawl to see if they are now correctly accessible and indexable. 4.2. A content indexing issue? Verifying if there has been a decrease in your site number of indexed URLs with Google Search Console “Index Coverage” report and the specified reason for leaving them out of the index. If your pages are shown in Google Search Console as not indexed: Use the Google Search Console Index Coverage as well as the Google inspection tool to validate the specific reason of why the affected pages URLs have been excluded of the index: if the pages have been noindexed, if there’s an alternate page selected as canonical, if Google chose another URL as canonical different to the one specified, etc. due to an overlooked configuration issue that you can change.Do a manual check yourself by crawling your site with an SEO crawler too to verify all the affected pages with indexing issues and their specific meta robots and canonicalization configuration, that confirms what is shown through Google Search Console. After fixing the indexing issues, remember in this case too the “Validate Fix” option from the new Google Search Console “Index Coverage” report for the affected pages, which will recrawl to see if they are now correctly indexable. 4.3. A Google Search Console misconfiguration? Setting an incorrect preference for URLs parameters. Disavowing a high volume of popular backlinks. Setting an incorrect International Country Targeting. 4.4. A Web security problem? Verify if Google has detected any security problem (due to malware or spam) by checking the Google Search Console “Security Issues” area. If so, you should follow the process specified here to fix the issues and request for a review. If the traffic loss coincides with a rankings drop but you can’t find any new crawlability or indexing issues affecting your site: Check if your site has been manually penalized by not following Google’s Webmaster Guidelines -the reasons can go from having unnatural incoming links, keyword stuffing to cloaking- by checking if you have received a message warning about it in the “manual actions” section of Google Search Console. If so, action type, reasons and areas of the site affected will be provided there and you’ll need to take the appropriate clean-up or optimization steps before asking for a reinclusion review. If it’s a link related penalization you can use tools like Kerboo, Link Research Tools and CognitiveSEO to do it. 4.6. A Google Search Algorithm Update? Finally, if you haven’t received any manual action message -but the traffic loss coincides with a rankings drop and there aren’t any new crawling and indexing issues-, verify if you could have been negatively affected by a Google search algorithm update, by checking the correlation of Google’s algorithm updates with it. As well as checking SEMrush and Sistrix organic rankings and visibility shown to your site and look if there are any updates listed directly there coinciding with the drop. Additionally, you can use the Panguin Tool. If you have gone through the checklist you should have been able to identify the cause of your site traffic drop! If there’s an scenario that you have found that hasn’t been added, let me know by sending me a tweet. 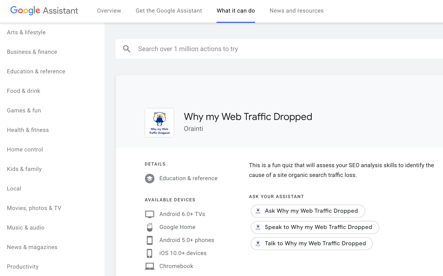 I’ve created a fun quiz for the Google Assistant (so you can use it via the Google Home or smartphone) based on the “Why my Web Traffic Dropped” checklist questions. This quiz will assess your SEO analysis skills to identify the cause of a site organic search traffic loss! Check it out. By Aleyda Solis, SEO Consultant & Founder at Orainti.